A police investigation into child-abuse allegations at the Haut de la Garenne former children's home in Jersey has ruled out murder and dismissed many of the claims made by the initial police investigators. Two years after the start of a covert investigation into abuse following allegations by former residents, Jersey Police started an exploratory search of the home and made their first significant discovery on 23 February, finding what they believed to be a skull fragment. 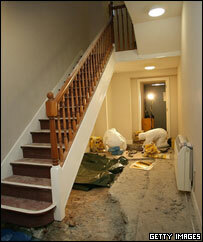 It was under several inches of concrete in a stairwell in the north west corner at the back of the building. Initially the remains were thought to date from the early 1980s, but police later said they were no longer part of the investigation. Experts reviewing the find said it was much older than first thought, and that the earth in which it was found dated from the Victorian era. Police now believe the fragment is not bone at all, but rather wood or possibly coconut shell. The children's home closed in 1986 and was later converted into a youth hostel. Four underground "chambers" were found beneath the house, the first described as a room about 12ft (3.6m) square uncovered beneath two concrete floors. It had been identified by police as a focal point of the investigation following interviews with a number of former residents of the home, who described "punishment rooms". Two spots of human blood, from which police hope they can extract a DNA profile, were found on a large, concrete, bath-like structure in one corner of the room. 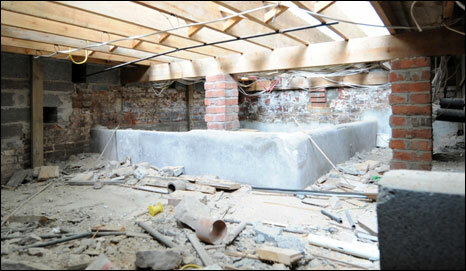 A "trap door" - a space in the floor above the cellar - was also found. After clearing the first room police broke into a second underground "chamber", three times the size of the first, and then into a further two "rooms". But on 12 November 2008 one of the senior officers brought in to continue the investigation declared said the so-called chambers were in fact just holes in the floor and neither dungeons nor cellars. Twisted metal was "not a restraint"
A piece of twisted metal discovered there was initially thought by police to be a form of restraint. But the officers who took over the case said there was no evidence any of the material recovered was suspicious or had been used as a restraint. Stained items, dozens of fragments of what were thought to be bone and 65 teeth were discovered, pointing to killings or unexplained deaths. Police said some bones appeared to have been cut and there was evidence of charring on some. 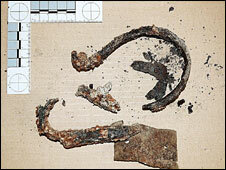 Police later revealed that the teeth appeared to have been from young children and had been "shed naturally". And what had been thought to be minute specs of blood on some items could not be positively confirmed as blood by forensics experts. The bath was not connected to a water supply. Search dogs also showed interest in the central courtyard of the complex, which police initially suggested they would search later. How can a dog sniff through concrete? Police began excavating earth in the grounds of the house on 28 February, in an area that had also attracted the attention of search dogs. They also used revolutionary ground-penetrating radar to identify areas of interest. 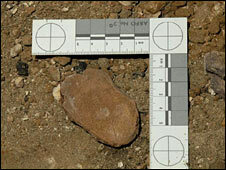 It pinpoints solid areas and voids, which may indicate that the ground has been disturbed. Detectives said the aim was to find out whether there was "anything of interest" below the surface. Mini diggers, like those used to dig trenches during roadworks, were brought in to shift large volumes of earth. The work covered a wide area, with some hedgerows ripped up. Police found 170 pieces of bone in the area of the main building and the grounds. 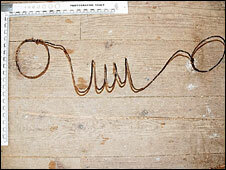 All but three were from animals, police said on 12 November. They said the others might be human, but dated from the 15th Century to 1950 at the latest. On 16 April police said they were excavating two pits following information from a man who said he had been asked to dig them in the 1970s or 1980s. The first pit, away from the house, was about 1.5m (5ft) deep, with a large quantity of lime at the bottom. A police spokeswoman said at the time: "The inquiry team can think of no reason why this pit would have been created, nor why it was filled with lime. We would emphasise that we have no evidence of any motive." The second pit was near what was a boys' dormitory. 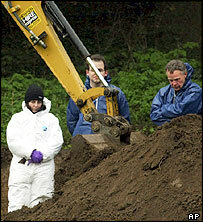 At their briefing on 12 November, police said there was no evidence of any pits to bury children.